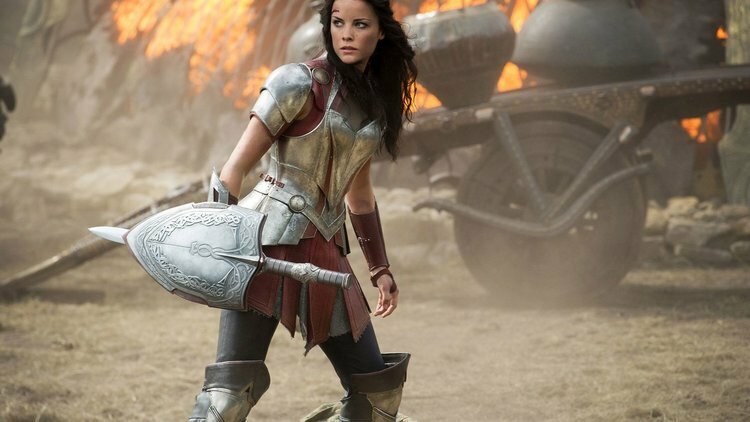 It was disappointing when Jaimie Alexander's popular Lady Sif failed to appear in Thor: Ragnarok, but it may have been for the best. If Thor's powerful Asgardian friend/lover had shown up, she likely would've been killed with the rest of the Warriors Three. While the Russo Brothers have said Sif was among those who fell victim to Thanos' snap of the fingers, we know most of those characters are likely to return, and that could be when Sif gets her chance to shine on Disney+. A new rumor at Discussing Film says Marvel is in the early stages of developing a Sif series for Disney's streaming service. Alexander would return to the role, presumably in-between her commitments to NBC's Blindspot. The show would join Loki as another Disney+ series tackling the Asgardians, so perhaps they can crossover? Others in the works include a Vision and Scarlet Witch series, and a rumored Falcon and Bucky teamup. I love this idea if it's true. Alexander has been crazy enthusiastic about playing Sif, and was disappointed when scheduling kept her out of Thor: Raganork. There's a lot more that can be done with her character that could make her more important in the MCU. She's one of the few big screen heroes to have slummed it with the Agents of SHIELD gang on Marvel TV.